FMNP’s goals are to enhance the food security of low-income families and seniors, and to strengthen local farmers’ markets. The New York State Department of Agriculture and Markets administers the Farmers’ Market Nutrition Program (FMNP). 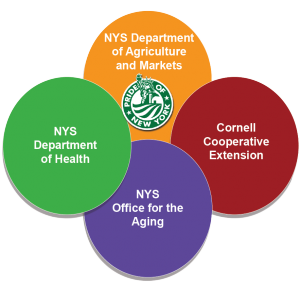 The Department collaborates with the New York State Department of Health, the New York State Office for the Aging, and Cornell Cooperative Extension in administering the program. Through county-based Extension staff, CCE provides outreach for the Farmers’ Market Nutrition Program statewide. Staff provide educational programming to help WIC participants and low-income seniors select, store, and prepare fresh produce from the farmers’ market. FMNP Outreach also focuses on developing tools for CCE educators. Tools increase educators’ capacity to serve as resources to nutrition assistance program participants, farmers, market managers, and community agencies involved in FMNP.